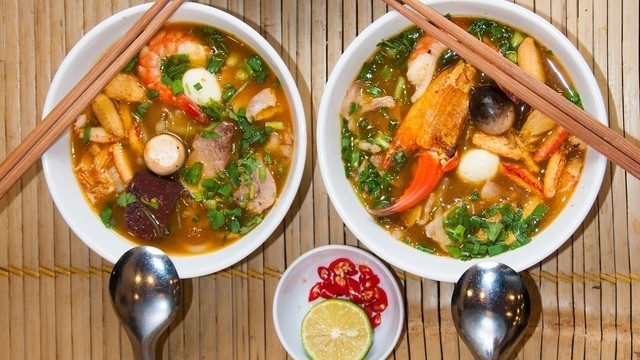 ‘Banh Canh Ghe’ is an amazing Vietnamese dish of thick rice and tapioca noodles with crab. It’s a delicious street food in southern Vietnam. The broth of ‘banh canh ghe’ is thicker than you’d expect from a Vietnamese noodle soup. It’s clear and thickened with tapioca, creating a texture similar to the classic American-Chinese sweet and sour soup. It is made with banh canh noodles, which are round like bun but nearly as thick as your finger. The broth’s sweetness comes from the fresh crab, as well as a little sugar. It’s also made with pork bone, garlic, dried shrimp and squid. Floating in the broth are fresh herbs, green onion, sliced pork, a shrimp and a quail egg. The small morsels of fresh crab can extremely satisfy to someone used to the field crab crumbles of bun rieu cua (field crab noodle soup).